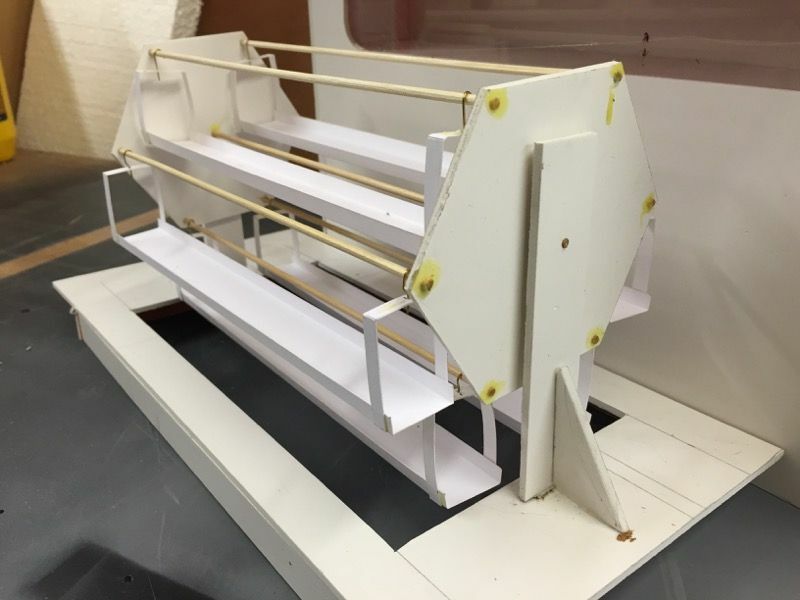 Our initial thought was to have a traverser fiddle yard, be that manual or powered. requiring a far amount of space behind the layout to get the full travel. With this would come the leverage effect due to the weight of stock. Thinking caps on, a fresh cup of tea and we set to work devising an alternative. 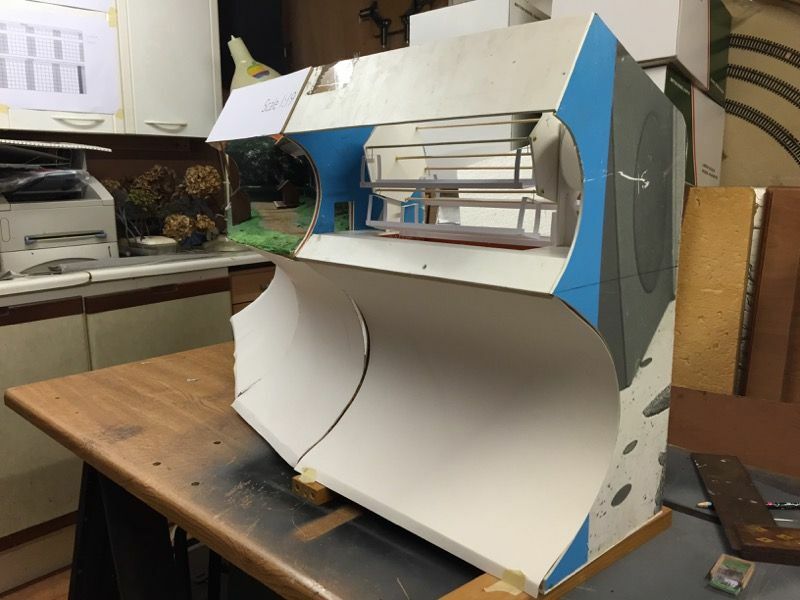 A quarter scale mock up was constructed to get a feel if this could be viable. 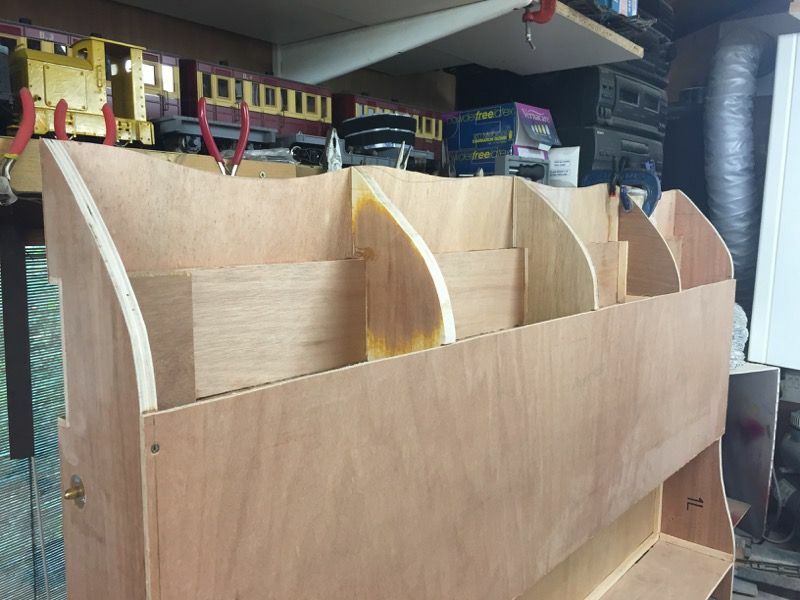 It seems we can get a six road fiddle yard in less than the baseboard depth and fully contained within the last layout board. We have the potential for pairs of parallel exit roads at each end if required. Here can be seen the powered end, which may be by stepper motor or some other motor currently under investigation. 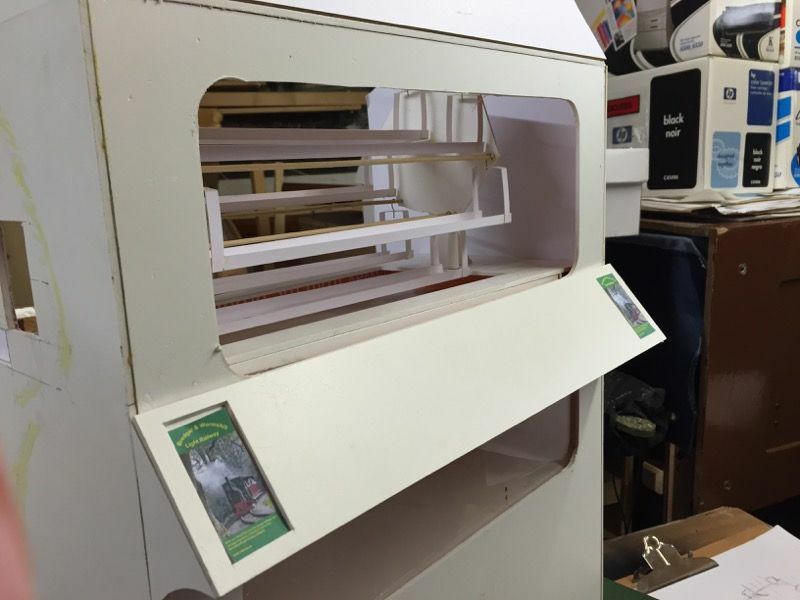 It will fit quite nicely in the fiddle yard cabinet. 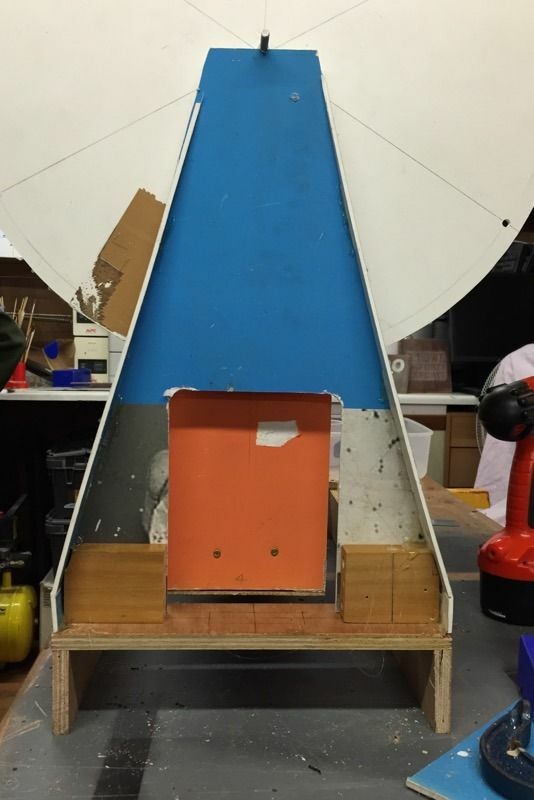 along with controlling acceleration and deceleration of the rotation. 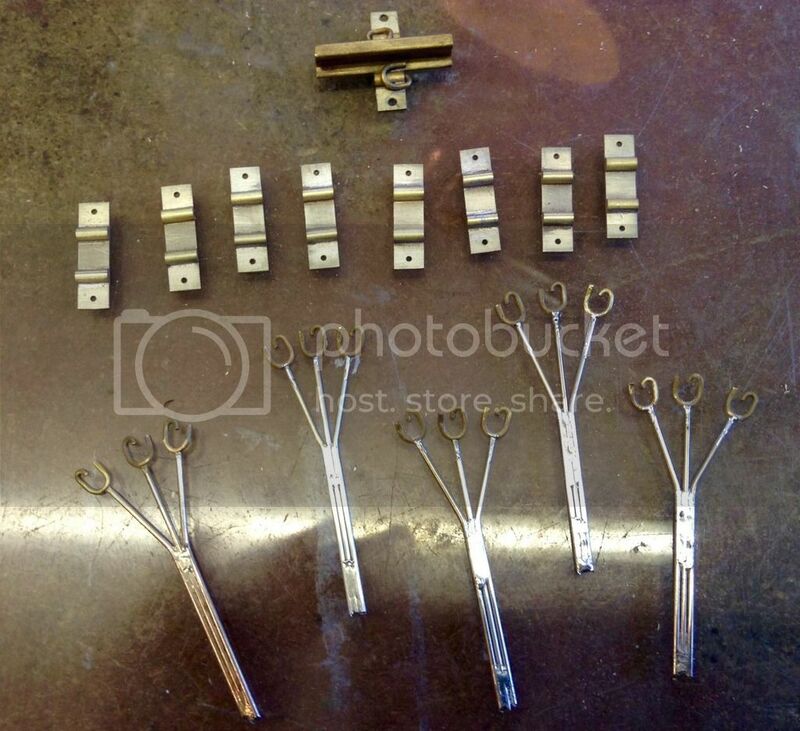 Possibly the use of power location pins, but more likely to be powered side clamps. 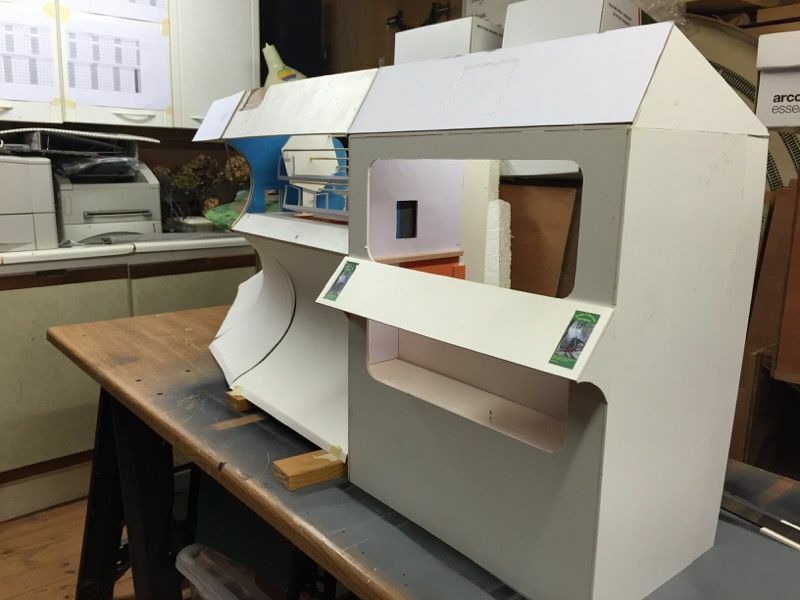 so a full size mock up was made of the current final solution to prove the concept. and this could well be the solution activated by the locating clamps. 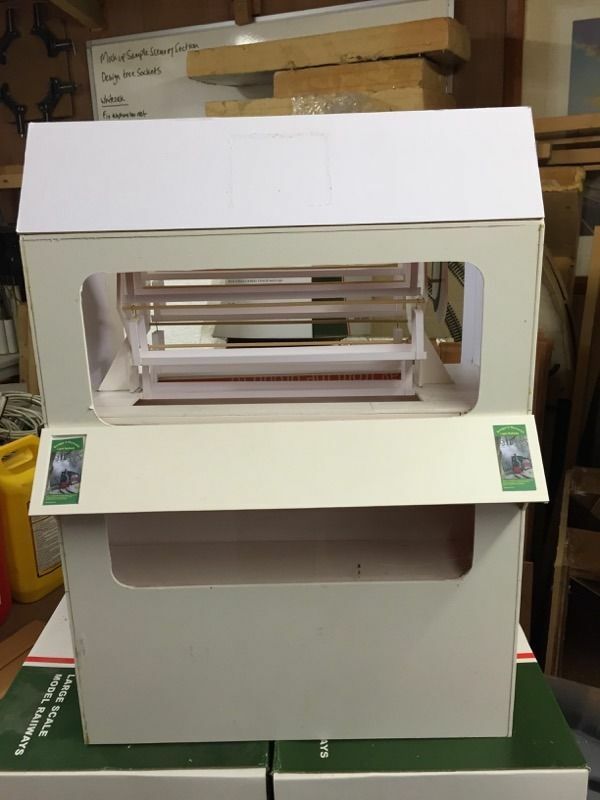 A counter balance weight pivots a bar up which only has to prevent stock rolling off the edge. This will all be refined to the minimum required to achieve the aim. Although pleased with the concept something was not quite right with the presentation. rather than the cabinet affair we had at the moment. original design nearest, the refined version furthest away. Removing the original cabinet really shows how the new fiddle yard will integrate well with the overall layout design. The next meet up saw the construction of a full size 'part' RotaYard to get a feel for sizes. which means reshaped end supports. to do the job the twin exit was designed for. Parts are starting to arrive, baseboard alignment dowels are now here. on some offcuts of ply I had kicking around. 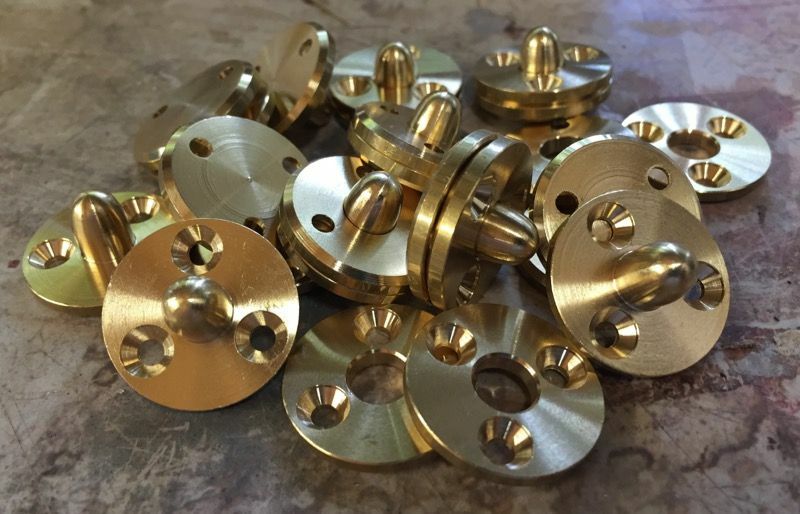 thought turned to devising a method that should ensure perfect installation and alignment each time. 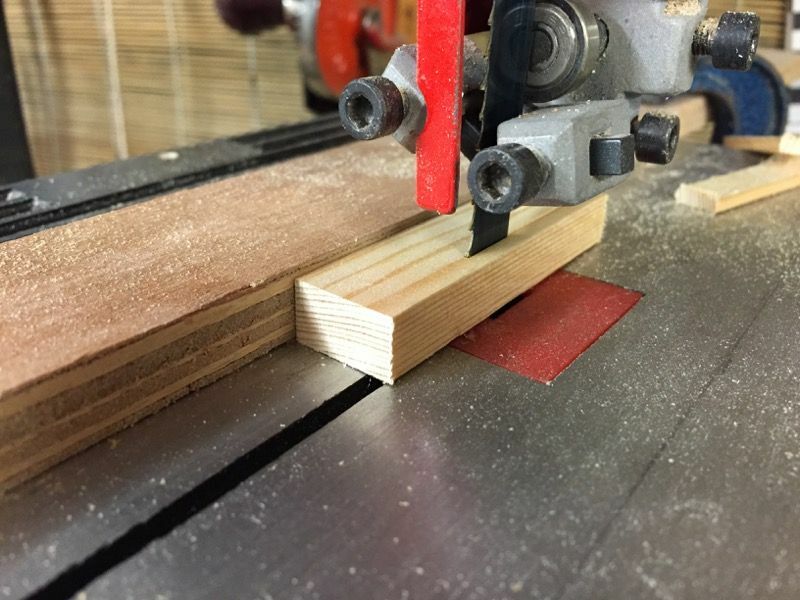 unless you jig up and clamp the timber perfectly. 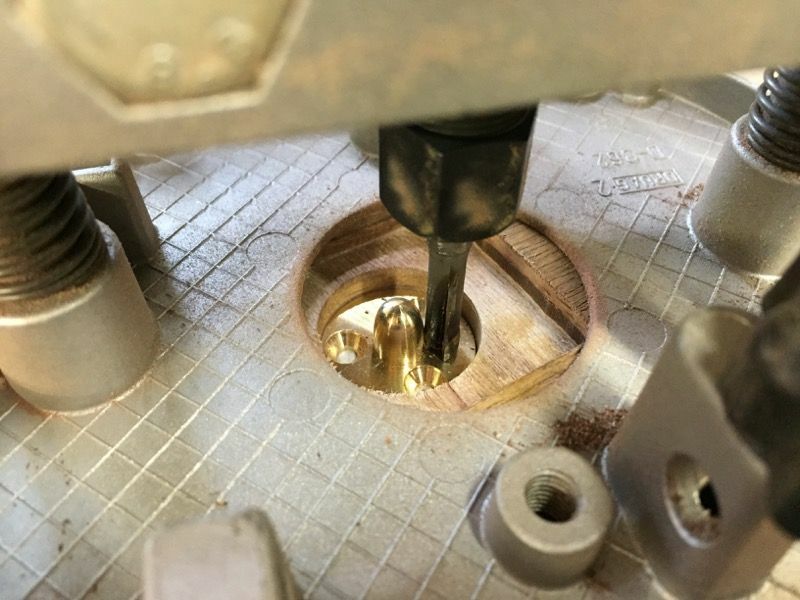 far better to use a forstner bit. using a pillar drill to ensure an upright hole. 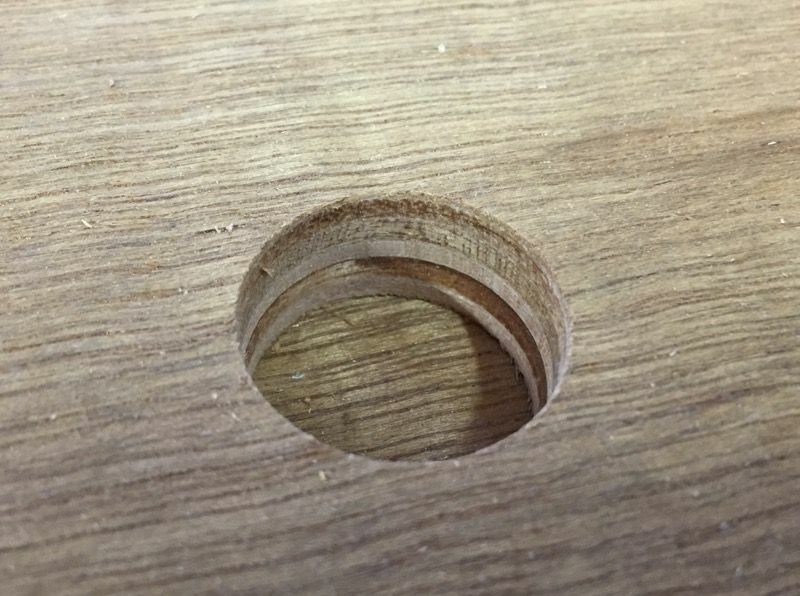 This leaves a nice clean hole which is a snug sliding fit for the dowel plate. 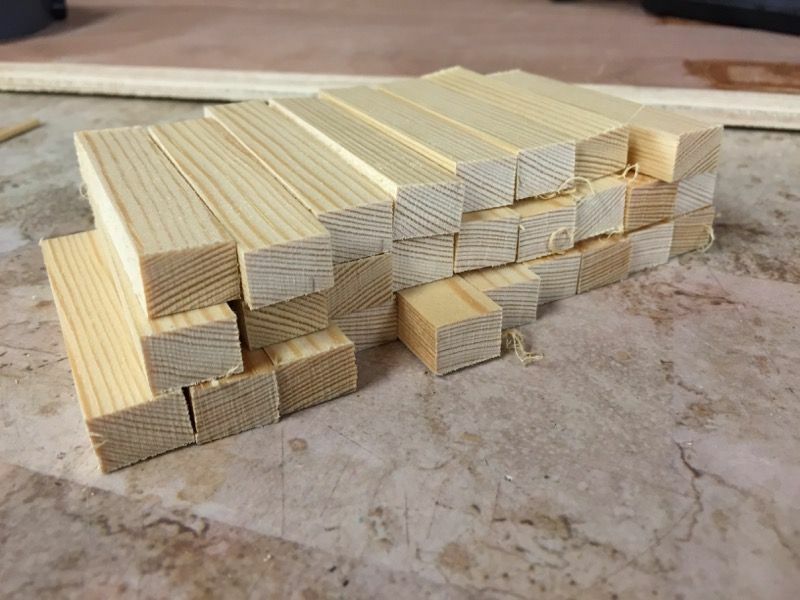 This picture shows just one of the end boards. 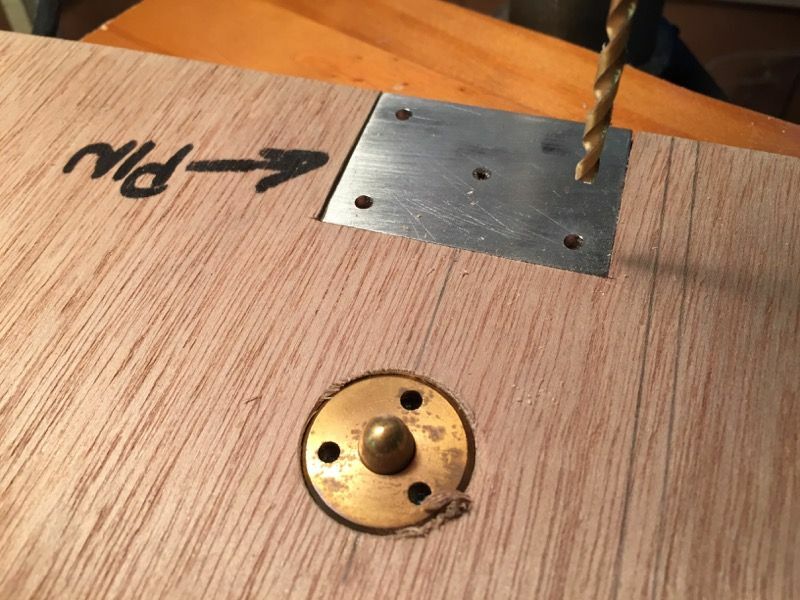 there is nowhere for the dowel plate screws to affix. Solution is to route out a space for a block, roughly 40mm x 40mm to be glued in. To do this I first took an initial light cut from the back. Easier to do it this way rather than take out the whole depth in one go. 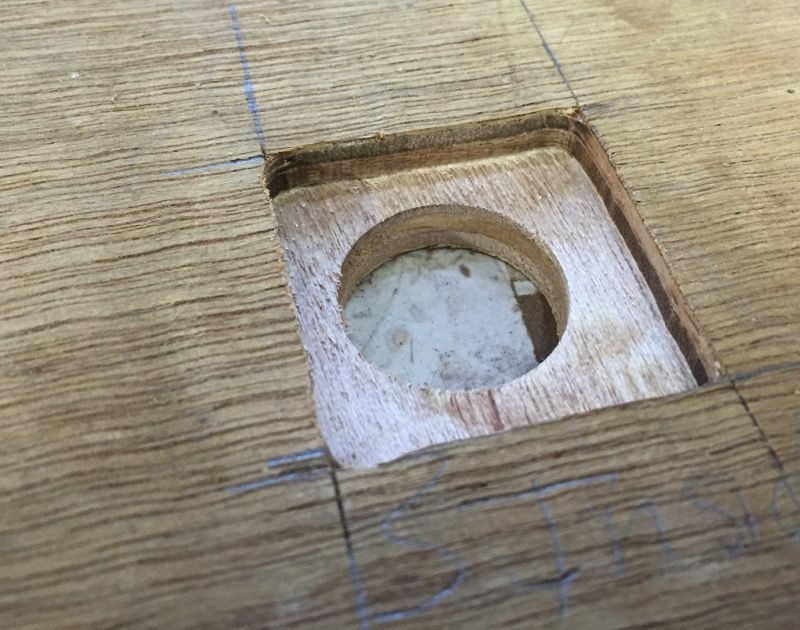 which will eventually leave a hole that will take a dowel plate, that will be set slightly below the end board surface. because they are such a snug fit you need to grip the spigot to get it back out! Now it is just a case of routing out to the full depth. this is when I found out I needed to have a shim under the dowel. and just shave off a little more on the depth, the others were done with a shim. 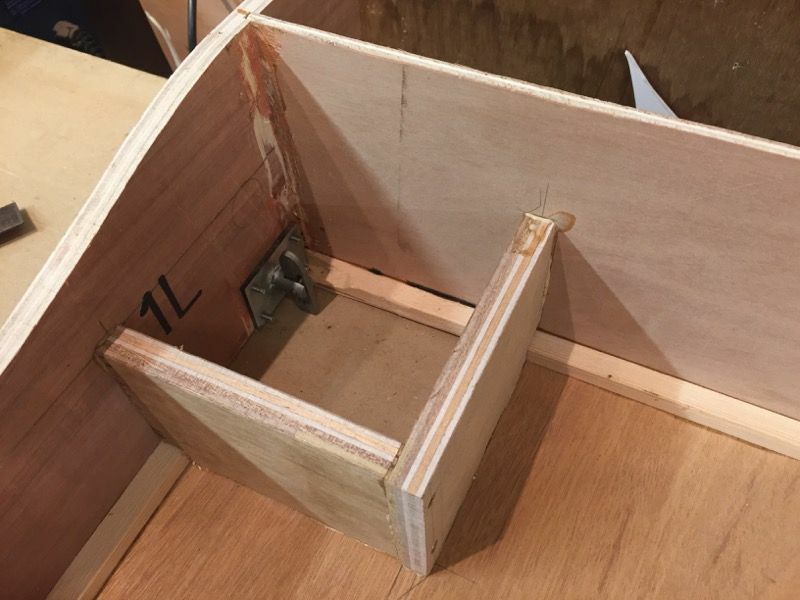 Then 40mm x 40mm blocks of ply were glued in to fill the hole just routed. Not pretty but I quickly chopped these up, left them overnight to dry. 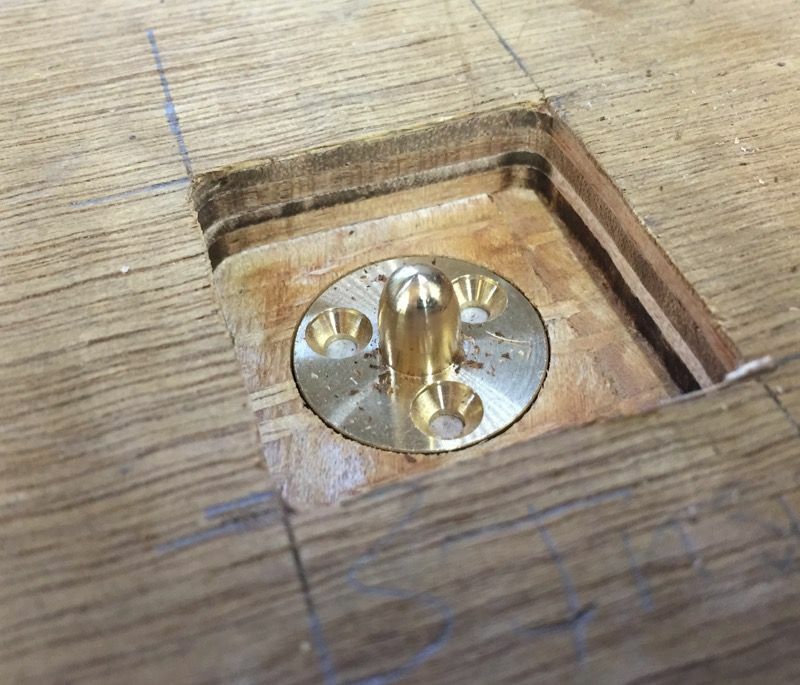 drilling a clearance hole though the middle using the plate as a guide. 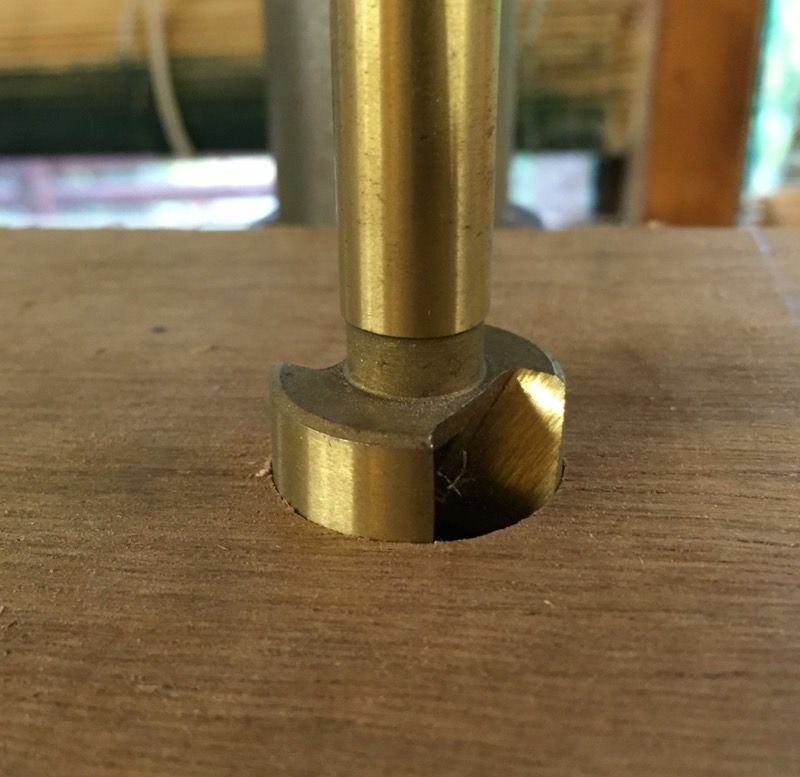 this gives clearance for the location spigot as it passes through the plate into the timber. Finally drop in all plates and fix in place with the screws supplied. 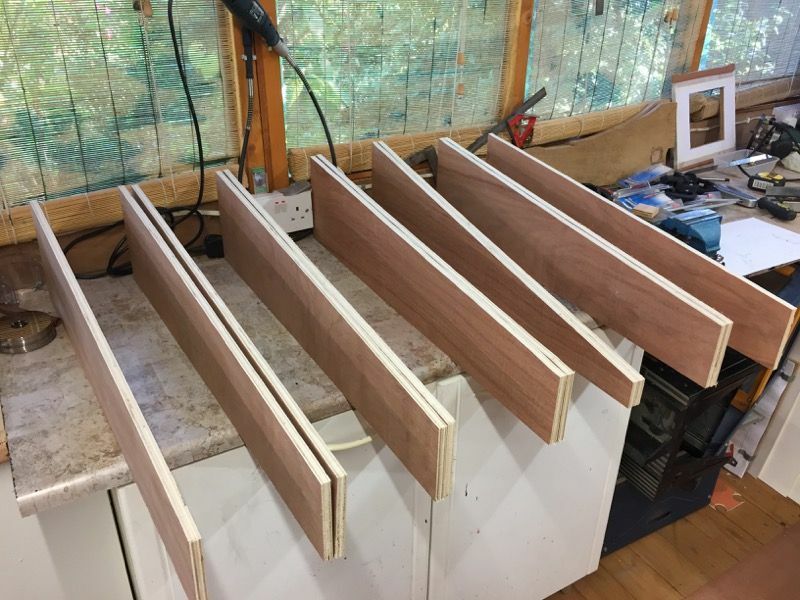 I am pleased to say the end boards aligned perfectly. 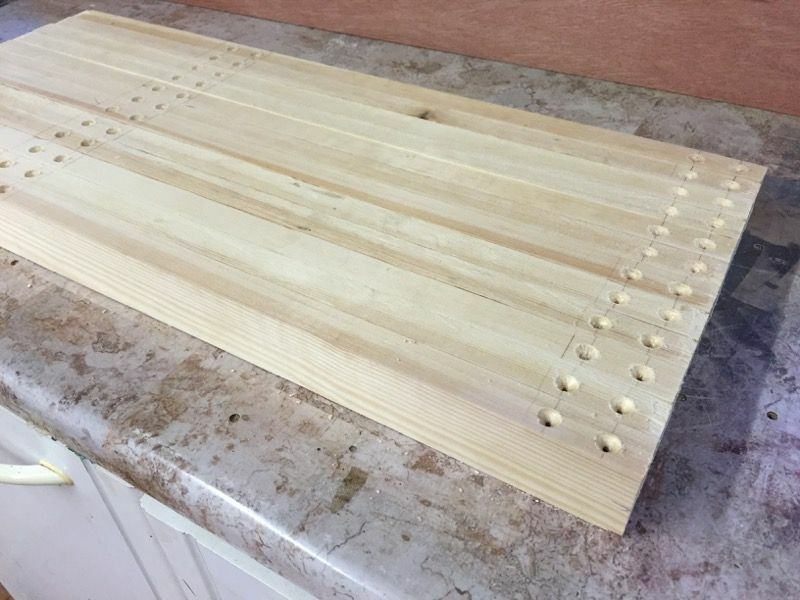 the patterns for the plain track base plates are under construction. side chairs and fishplates which will be off to the casters soon. 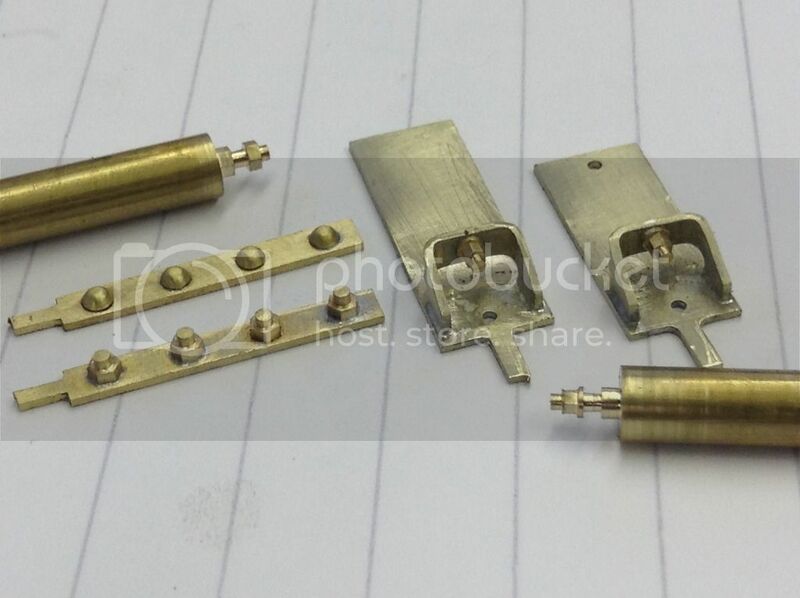 and to make shunting easier we have found the coupling pins need a loop fitted. 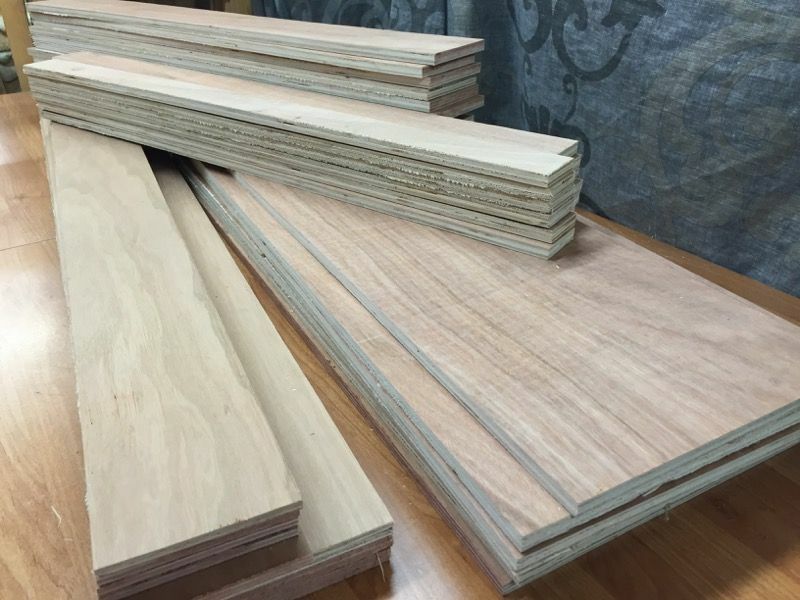 The first batch of plywood arrived, which we ordered as pre cut. from this I was able to mark off all the measurements for cutting and machining. 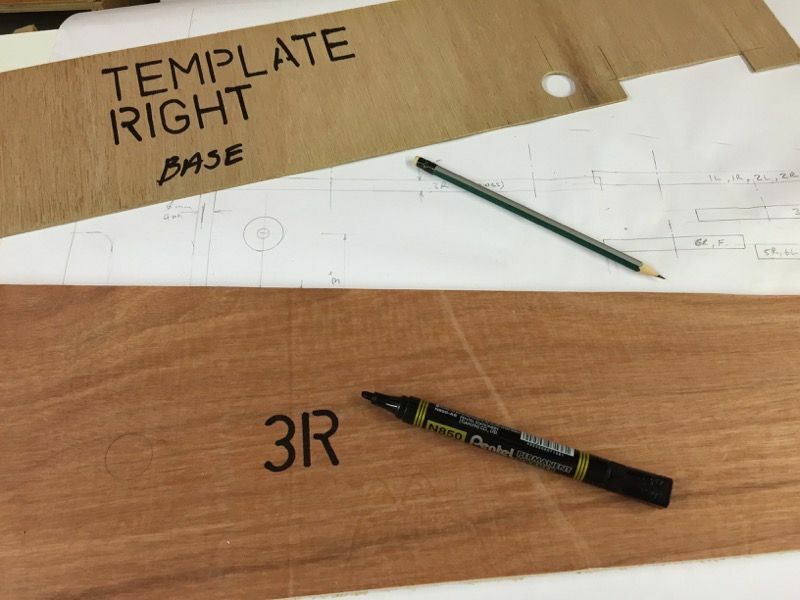 First I made a master template to guide where to drill the dowel holes and cut the front main stretcher girder slot. this was time well spent it made the cutting work a lot easier and confident the right piece was cut the right way round. 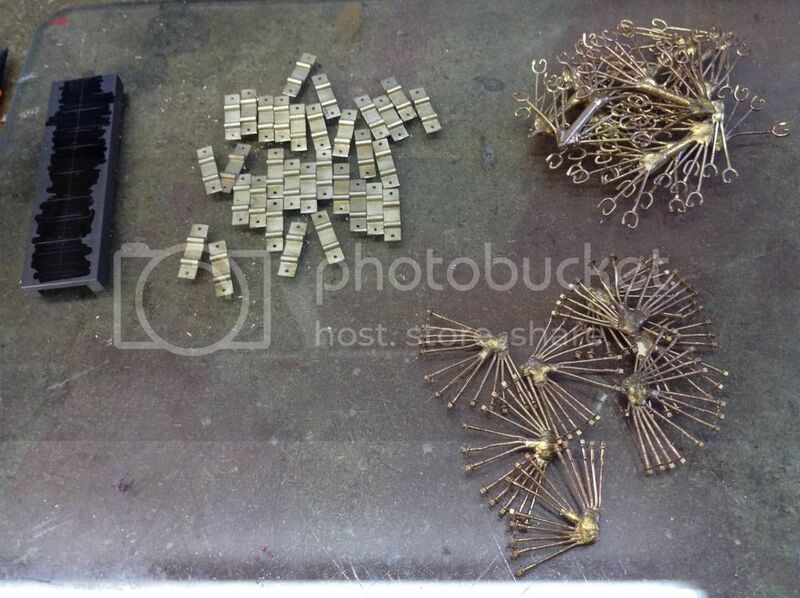 I set them out on the bench in order just prior to numbering. 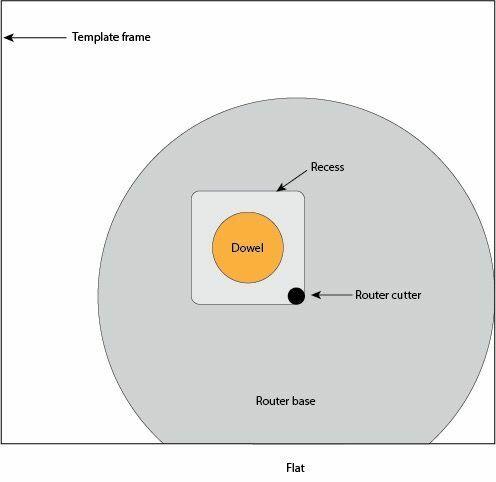 a template was made to guide the router to cut exact size holes. printed out and used as a template for making the template. 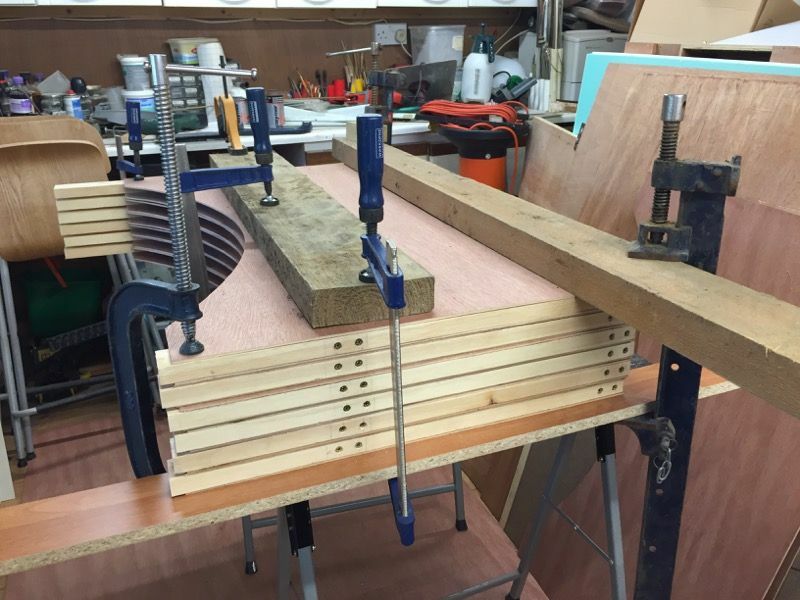 First stage of routing was the dowel recesses and the main back board spline slot. 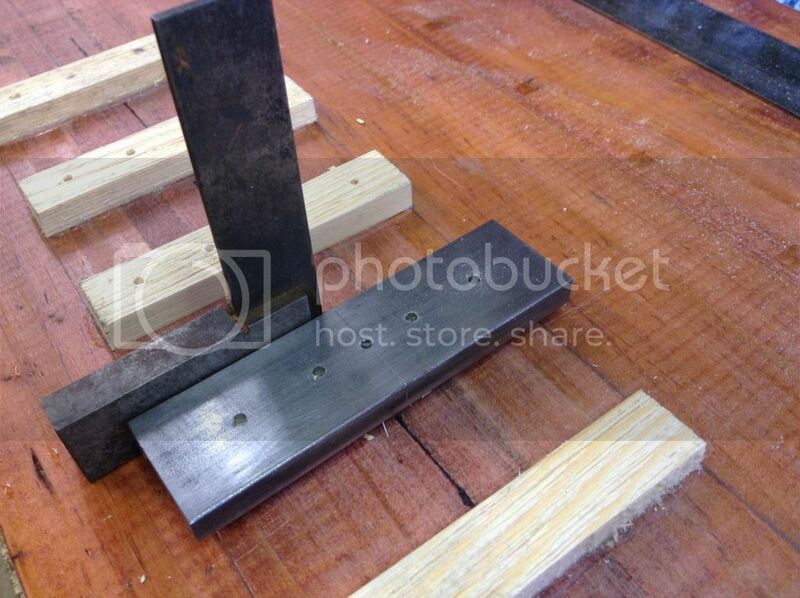 A bench saw was then set up to cut the track base support points on all the end boards. 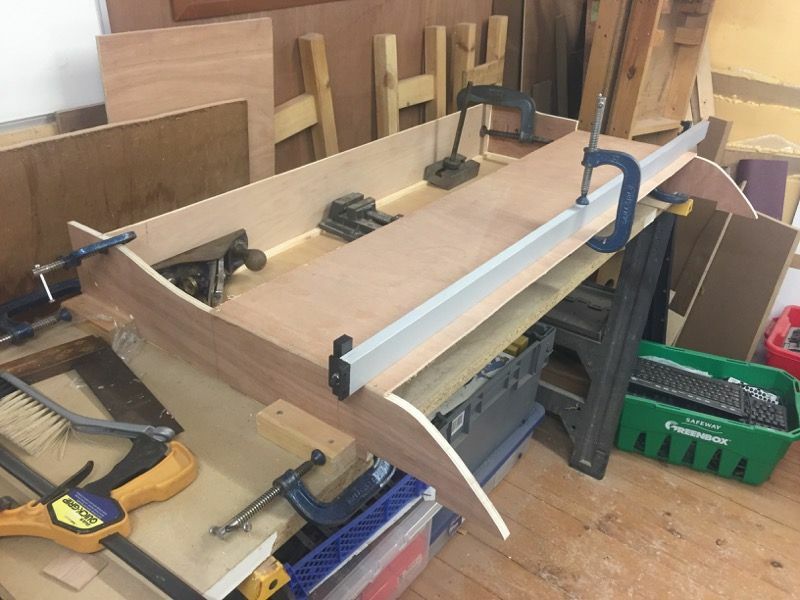 In pairs using the bench saw ensured they were parallel with the end board bottom edge. 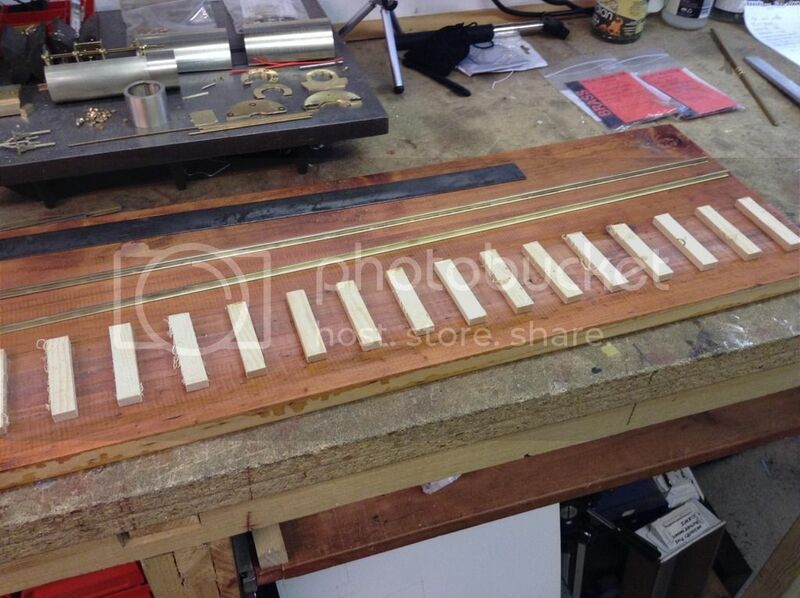 You can see in the picture the dowel backing plates have been stuck in place. 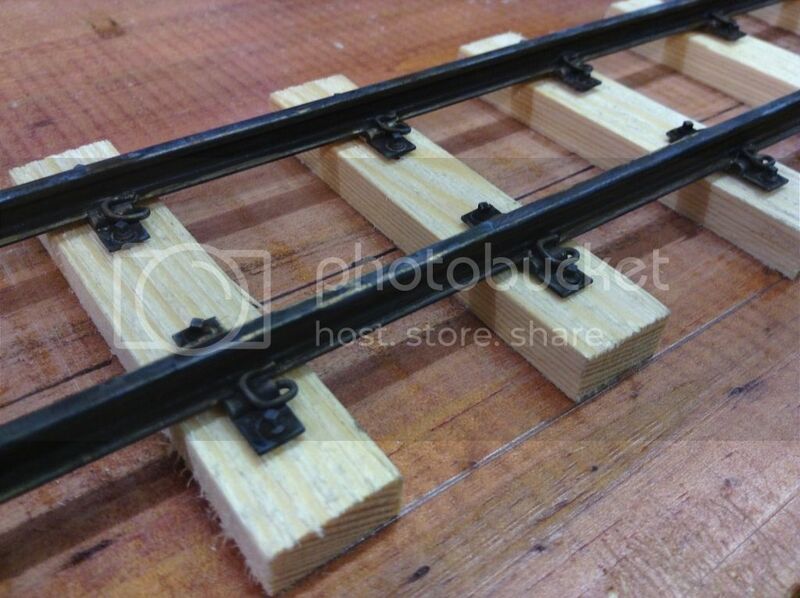 a start was made on cutting some sleepers for track test building. 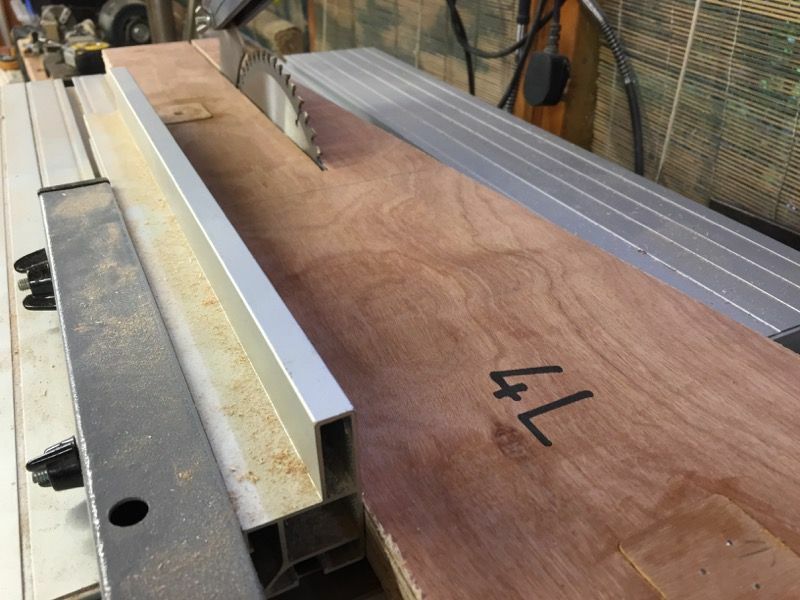 I used a band saw for this, here doing the first cut. A pile of sleepers awaiting the second cut. 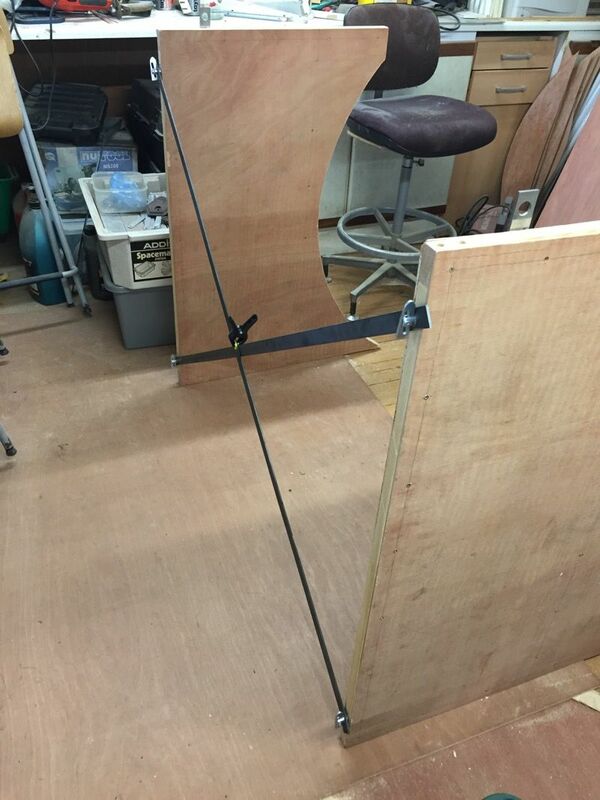 Simon made up a small length of track to test the assembly method. The pine sleepers are scale size and glued to a suitable lump of flat board. the colouring of the sleepers will be completed once the track is fixed. 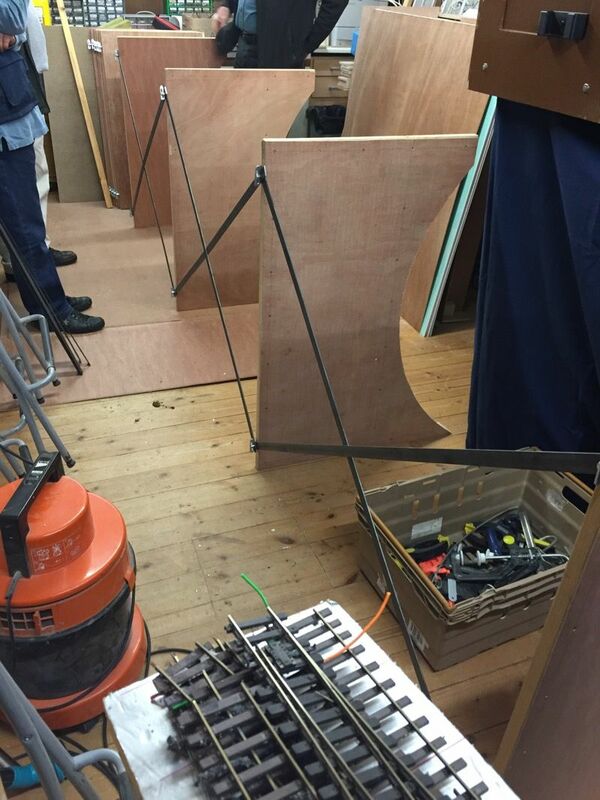 Firstly a centre line is drawn on the board, and next the sleepers are glued to the board. this is prototypical when you look closely at the track at Bredgar. 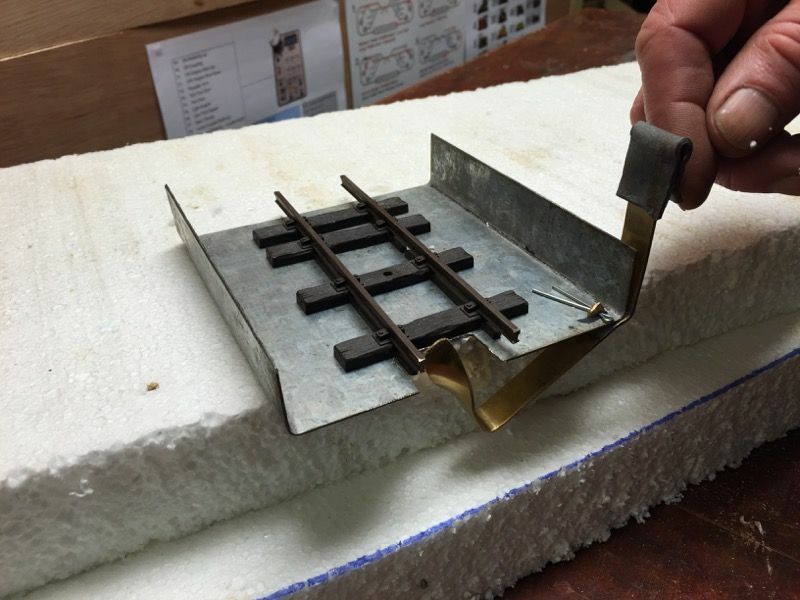 as we only have just enough nickel silver rail to complete the layout. 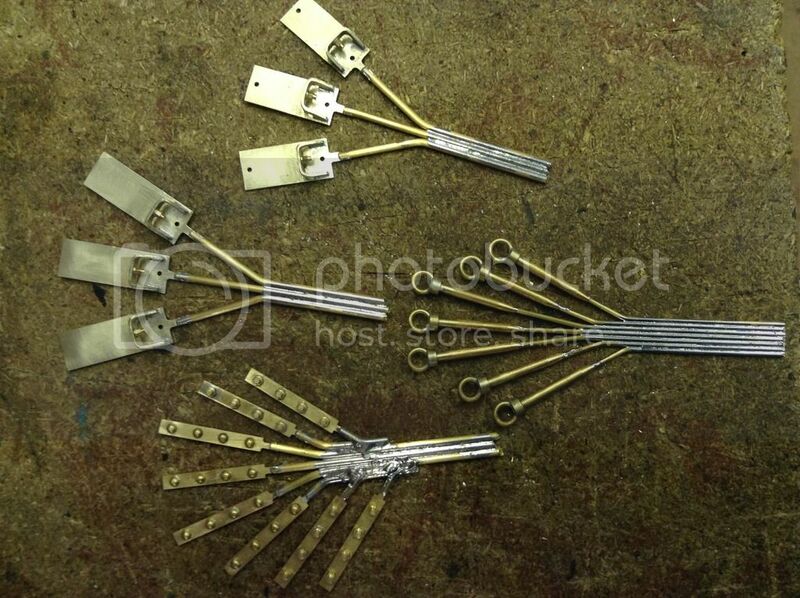 which are tubes that solder to the bottom of the screw and run through to the underside of the baseboard. 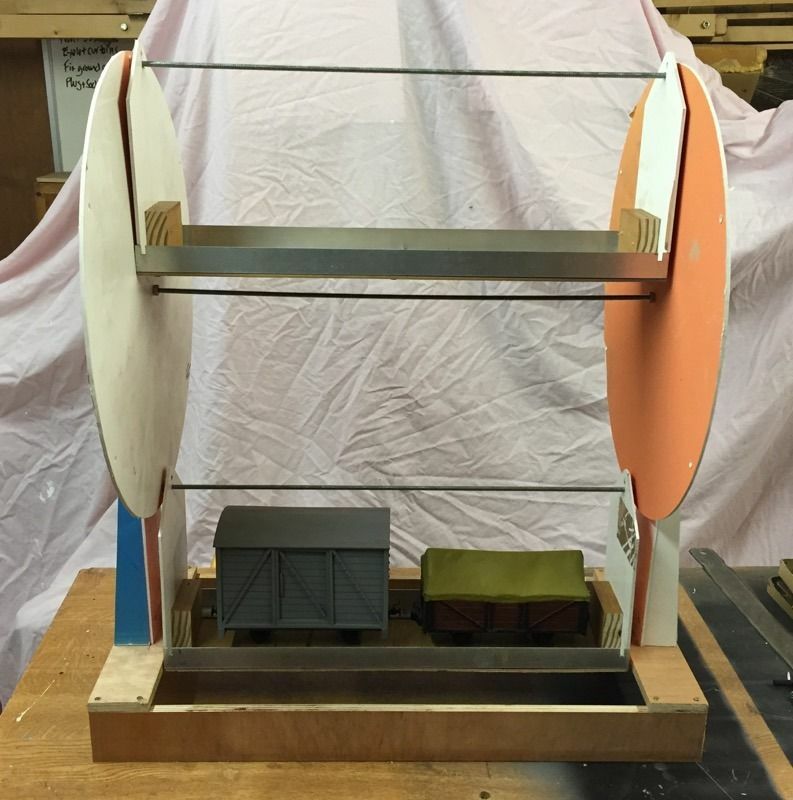 One of the early considerations was to have no visible wires showing on the layout. 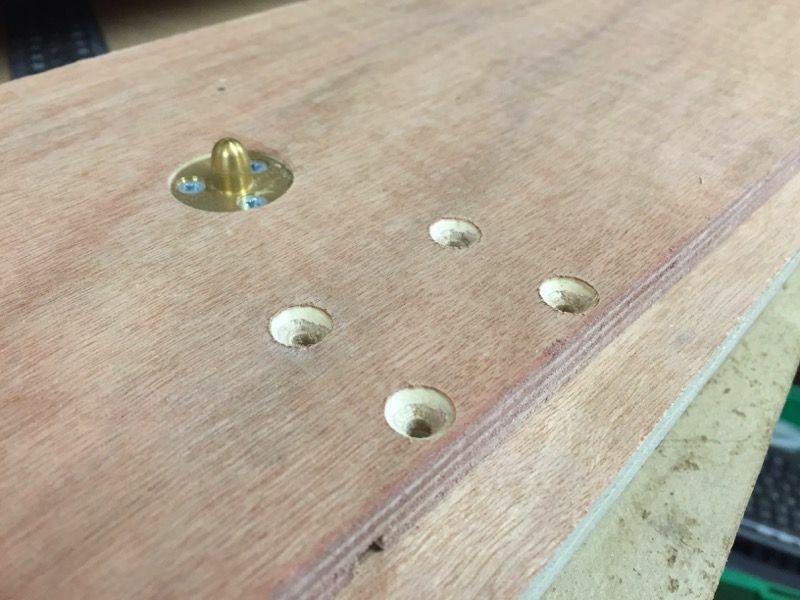 A simple jig has been made to drill the four holes to locate the screws that protrude through the plates. 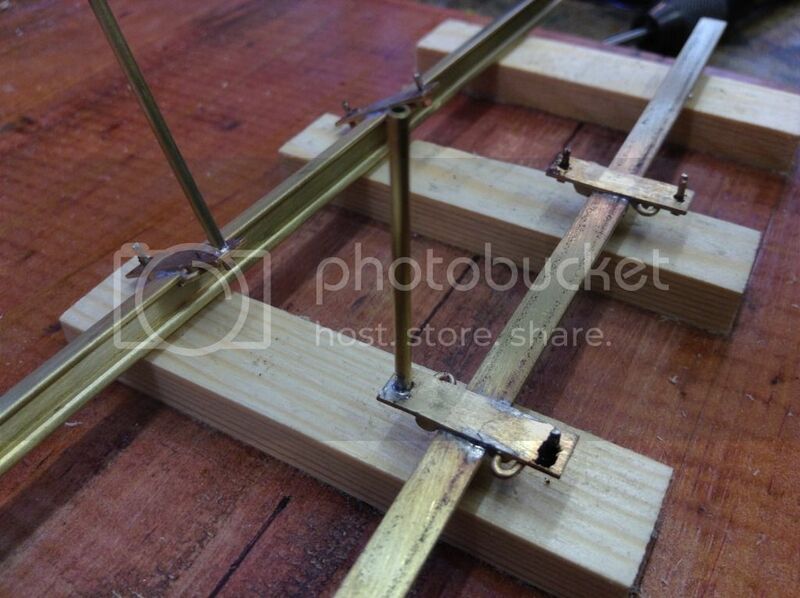 Using the centre line on the track base and on the jig the holes are drilled. 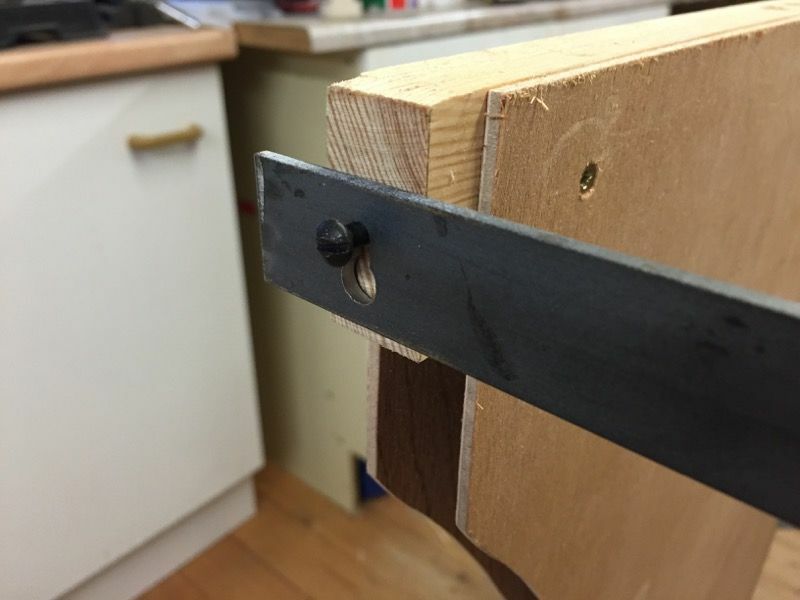 the rail can be soldered in place which gives a very strong joint. and that's a job for the artistic department. Rough overall track plan of the layout. 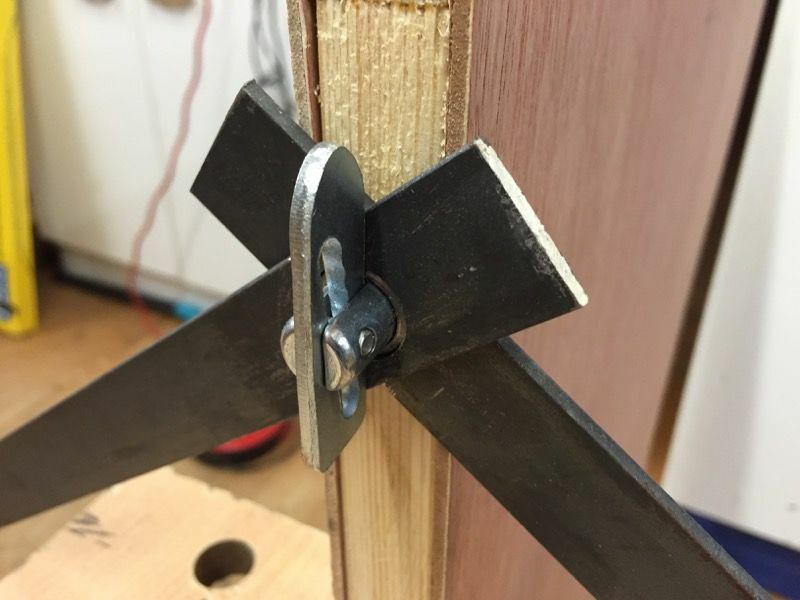 ... and making baseboard/support locating toggles. 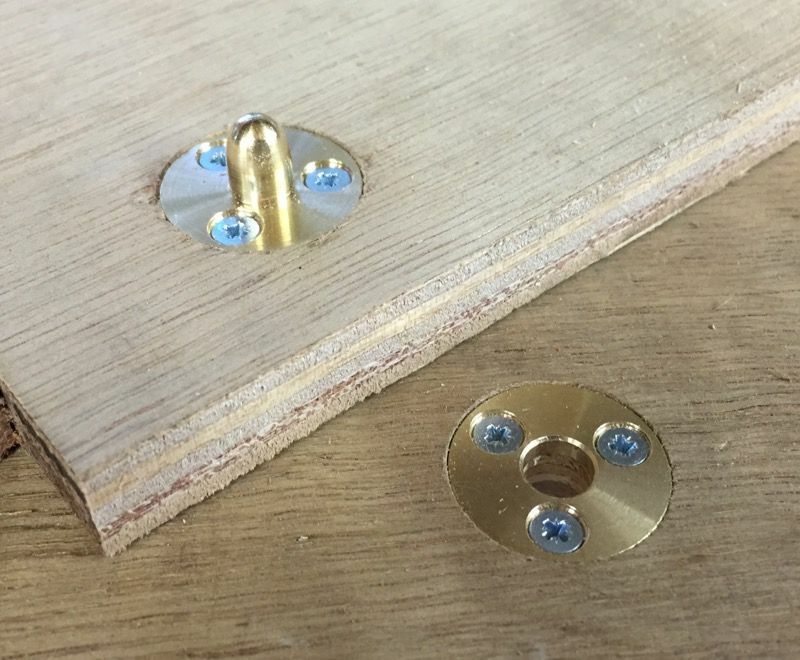 Using a jig and the template to drill the holes for the baseboard toggles mounting plate bolts. 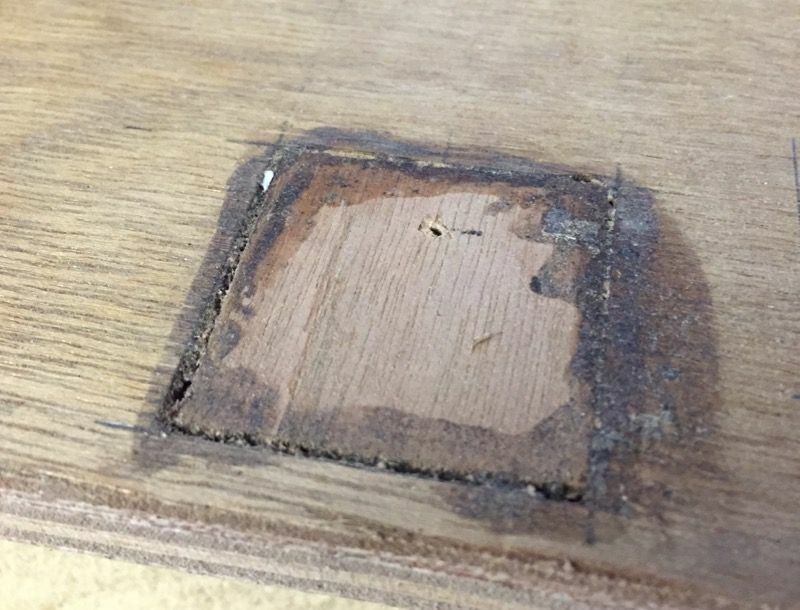 I used spare brass locating dowel plates to accurately locate the plywood template. 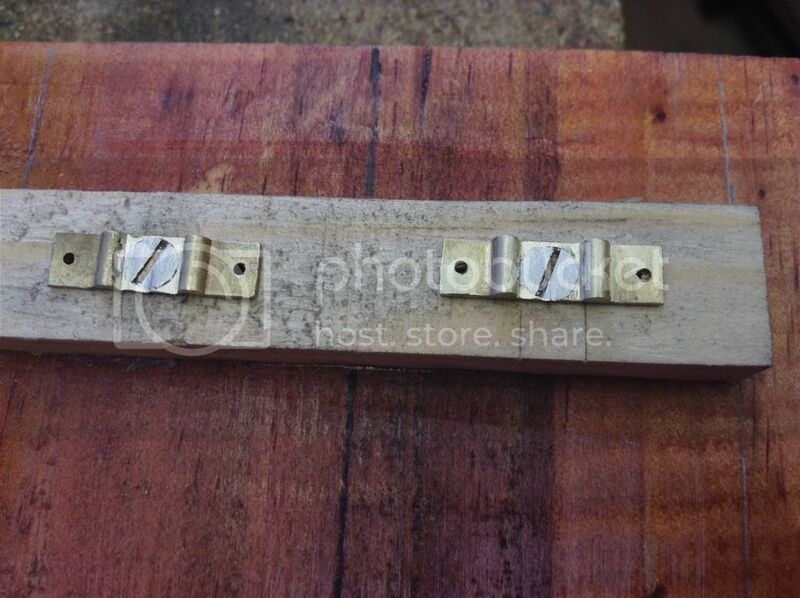 Then the holes were countersunk, just got to get the bolts now. First stages of assembly of baseboard number one. 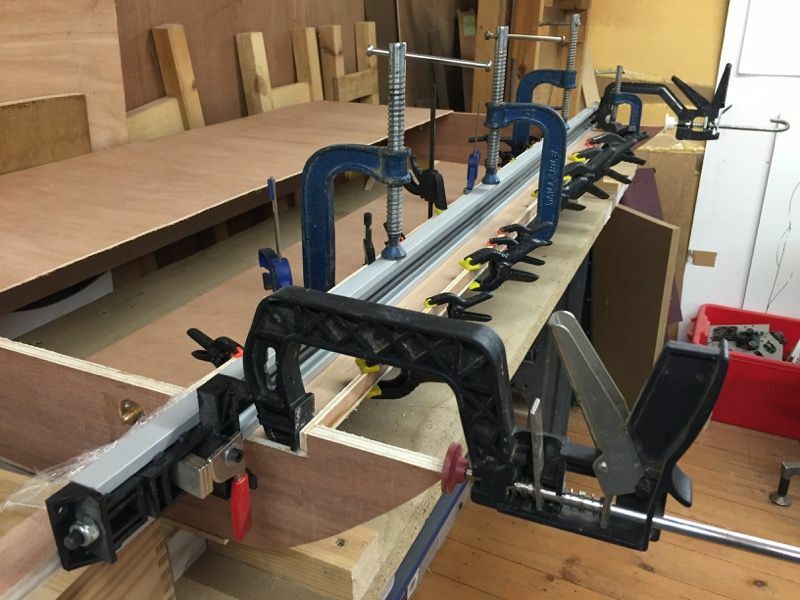 Glueing up the front lower beam, you can never have too many clamps! 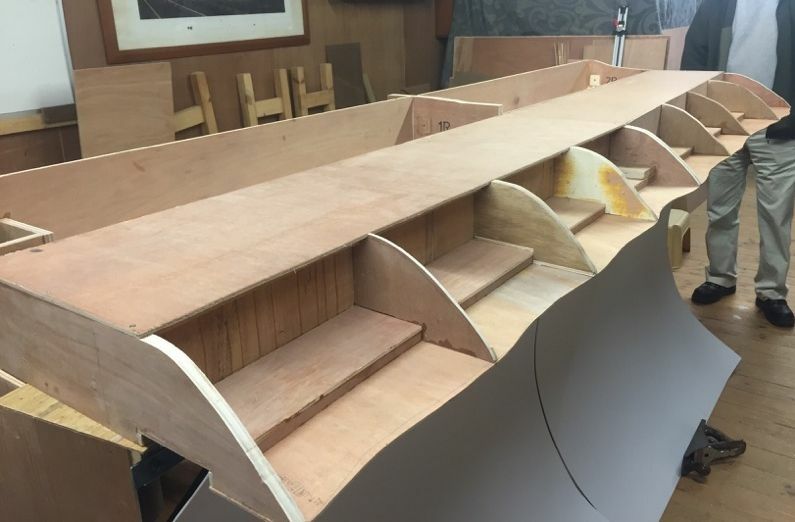 A few ribs at the front of board one now installed. Corner pockets are constructed on each board. These are for hand space while using the board toggles. 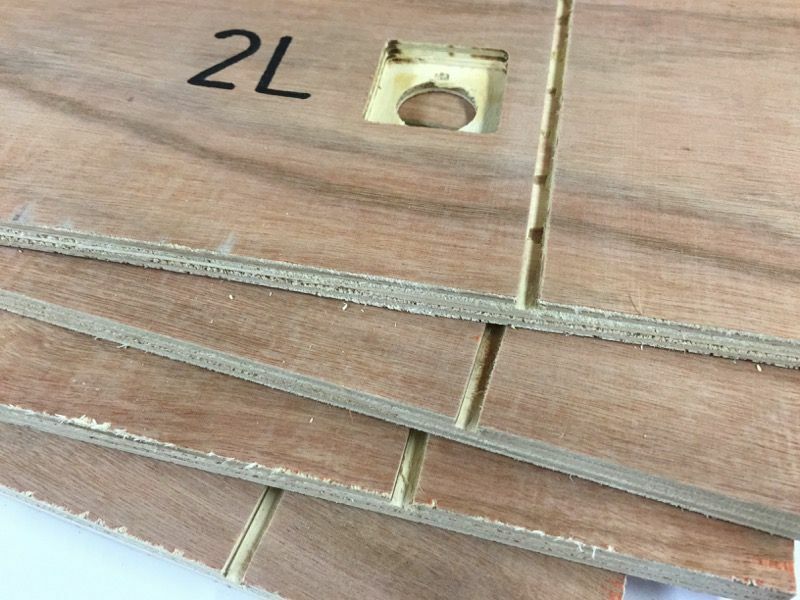 Inner timbers for the board supports were all cut and drilled in one session. mainly because we did not have enough clamps that were big enough to do them all at once. 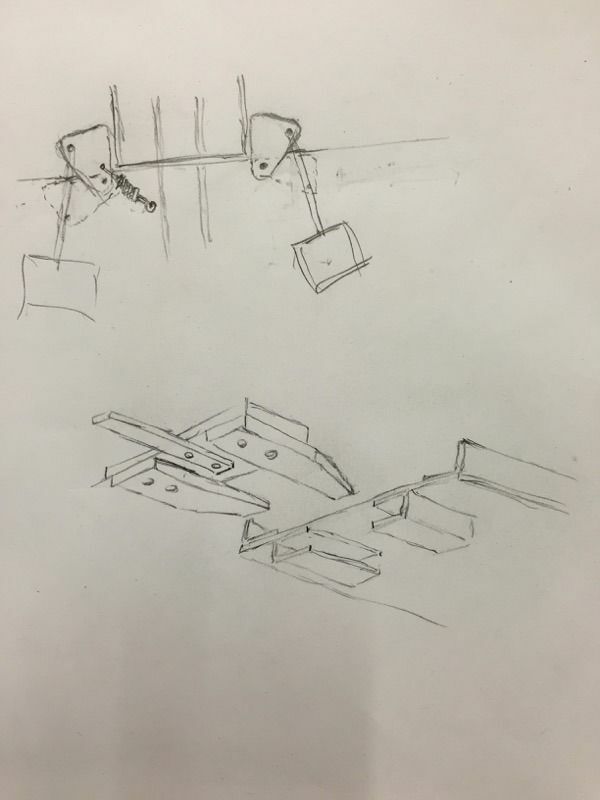 very similar to what can be found holding up trailer and pick up sides and end doors. was obviously larger than the toggle support screwed into the legs. which basically worked but we wanted something that was rock solid. which as you can see in the photo above gives a very snug fit for the bracing strip. 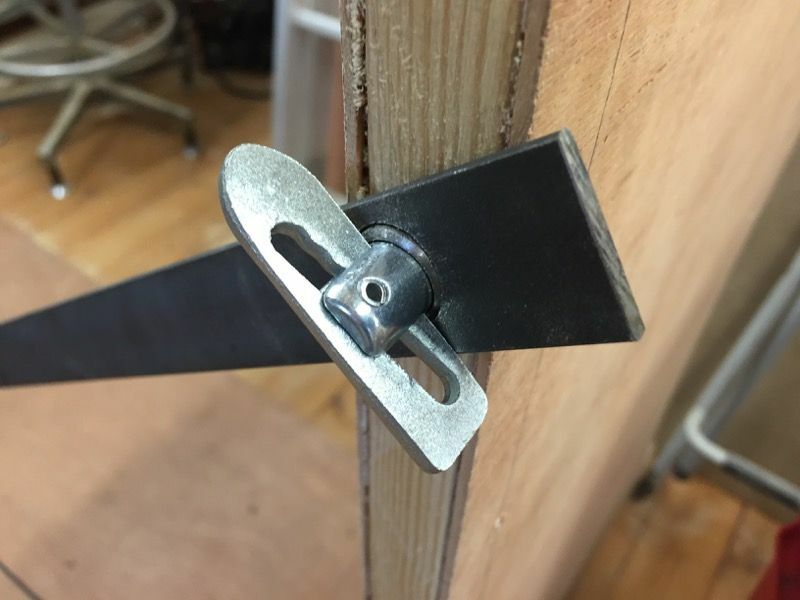 we machined a chamfered edge to aid guiding on the bracing strips. and because at this point the front bracing strips had not been thought about or indeed considered. although not necessary when the baseboards are attached. should that be needed while sighting the layout at a show. and the organiser comes along and says, can you move a few feet left! but many cups of tea later we revised it down to a strip of steel and a screw. 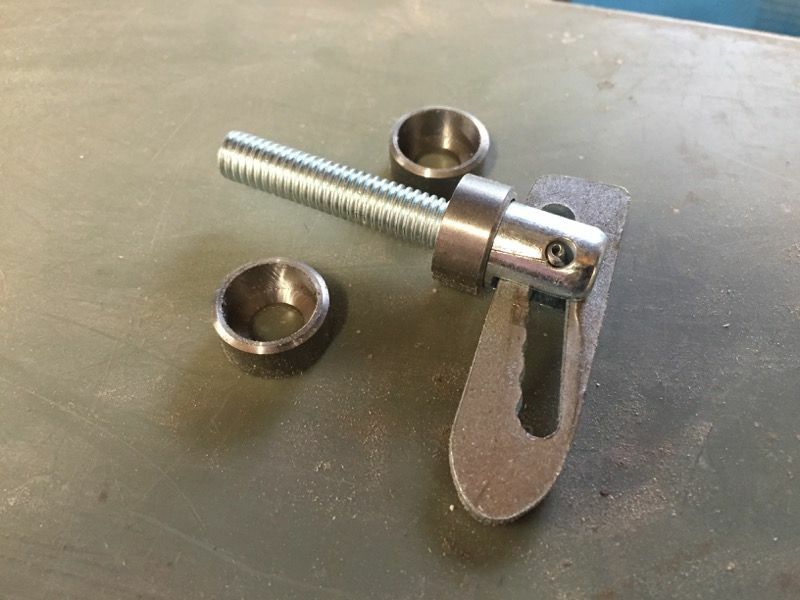 So front braces were fabricated from the same steel stock and suitable locating holes machined out. 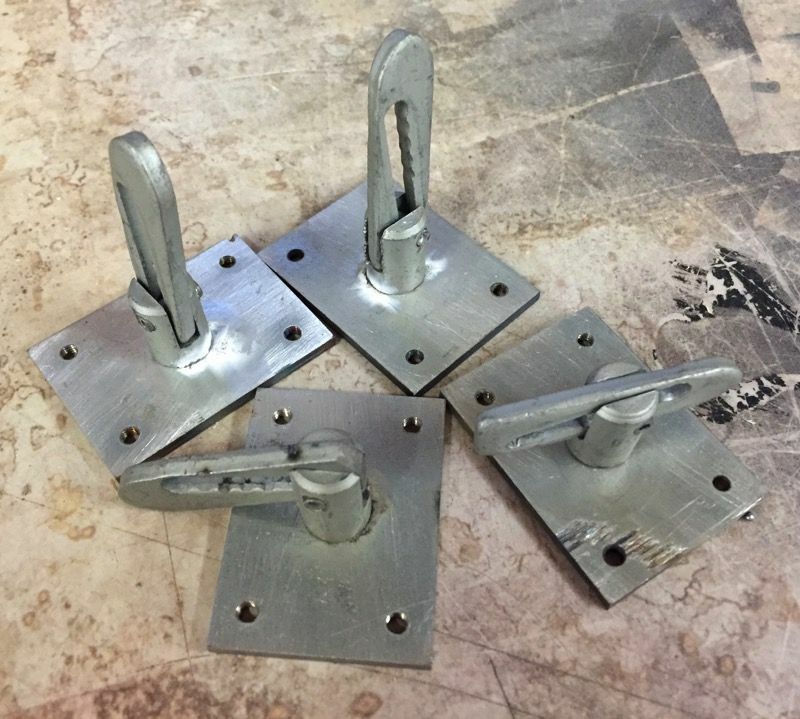 These are now simply dropped in place on the screws. which with the simple addition of a plate and trolley wheels mean no lifting required. 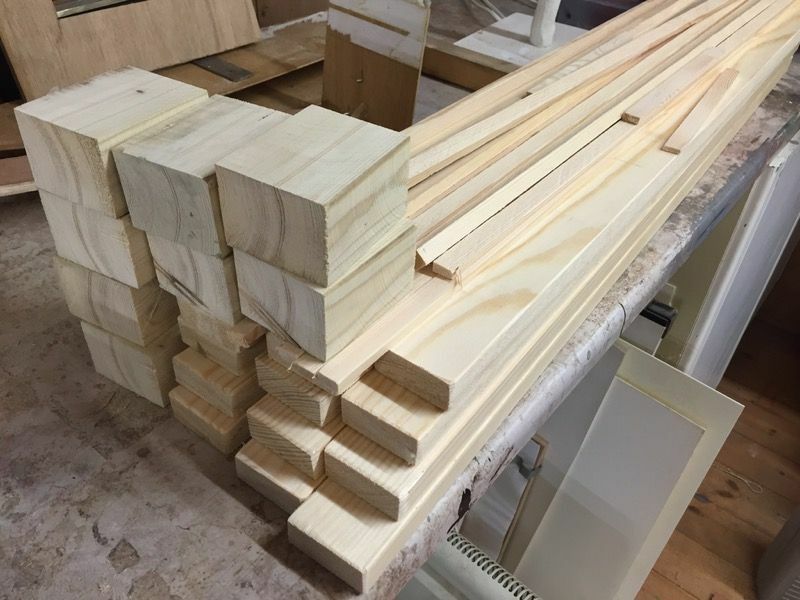 Here you can see the first two boards assembled and tested on the legs. The story of you guys build so far is pretty AWESOME ! The trackwork alone is an eye-opener !! I made the Thread title a bit more descriptive of your project Martin. As a second thought ... is this 'officially' classified as SM32 ? I suspect your gonna tell me it isn't ... Is your gauge 32mm ? ... with 'PECO' even making R.T.R. 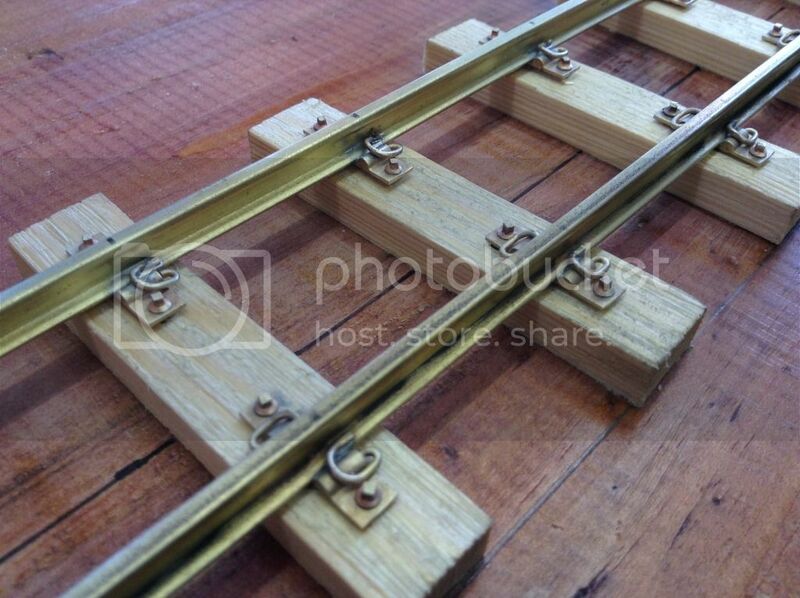 track of 32mm gauge, for 2' gauge 16mm/foot scale trains. Simple question from me Martin :- What are you using as a 'chemical blackener' ? Happy with the title change. 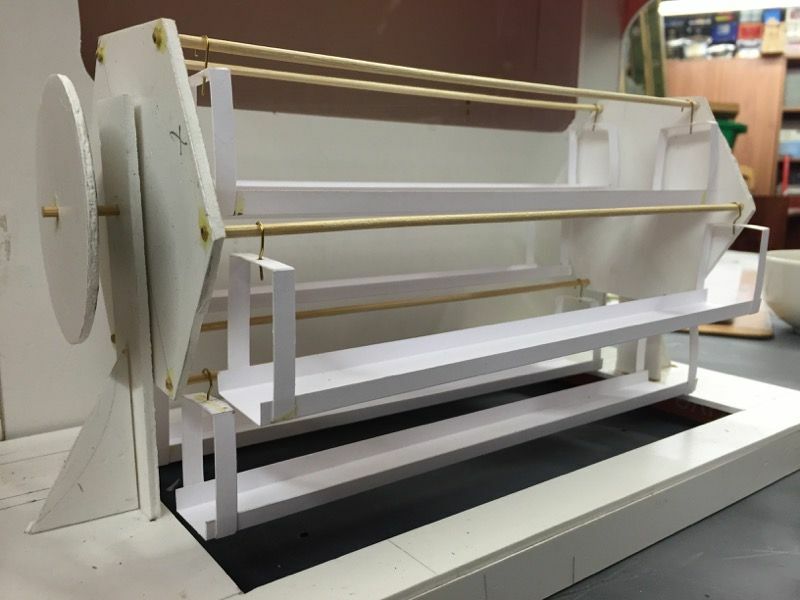 Yes SM32 is the size, we are modelling two foot gauge in 16mm to the foot scale, which also equates to 1/19th scale. For blackening we use Casey’s Gun Blue, usually get it from the gun shop in Biggin Hill. Will have another bash at updating the thread again tonight.